If you knew me, you’d laugh because that’s an understatement. I call the phenomena “Drop the book.” It’s like my brain decides, “You’re done holding that. Drop the book.” Then the book falls. It’s real. I have a friend who calls me “Trip,” not because I’m funny. And I think there are things in life that happen only to me. I mean, it takes a special person to cause a spectacular splatter of gooey chocolate all over her wall and stove. Once I accidentally flushed $150 down the toilet. You don’t even want to know. Most of the time I just laugh at myself. “Just love me,” was my coy reply. A friend told me that it really is a cute elegance. I’ll go with that. I also break things, but not on purpose. It always seems to be something with memories attached, though–a coffee mug my husband and I bought on vacation–a hand-painted spoon rest from when we were dating. On our first anniversary I even broke one of our personalized wedding flutes. You can imagine the tears. We never got around to replacing it either. To date I haven’t broken a dish in anger, but I’ll admit, when Jon died I often wished a box of cheap dishes would magically appear so I could smash them to the floor. And had they appeared, I’m almost certain they would have ended up in smithereens. Even then I had sense enough not to hurl the Fiestaware. Recently I broke my special spoon rest…again. I don’t remember how I broke it the first time, but I’m sure I was distraught and Jon his usual calm. We carefully fixed it with super glue, and its flaw was barely noticeable. I think I’ll be able to mend it again, but I this time the scar will show. When memories are all that’s left, a shattered one pierces that much deeper. So, I’ve been thinking about how God speaks of broken things. Often being broken is a mark of humility or surrender. I’ve been broken so many times. The process is painful, but it’s a sweet brokenness that teaches me to understand the fierceness of God’s tenderness. He draws near the broken hearted. Being broken and restored also reminds me of Kintsukuroi, a Japanese repair method that infuses broken pottery with gold. How ironic that the shards are mended with scars of gold! The result– a piece far more exquisite and costly, not in spite of the scars but because of them. In other places, broken things represent extravagant love. A familiar story, but don’t lose its radiance. A woman, identified elsewhere as Mary the sister of Lazarus, took a flask of ointment worth almost a year’s wages, broke it (for there were no screw tops in those days), and used all of it to anoint Jesus. Others around the table were outraged at her ridiculous waste and flagrant behavior. But her broken thing was an avenue for lavish affection and worship. She knew what was most important. 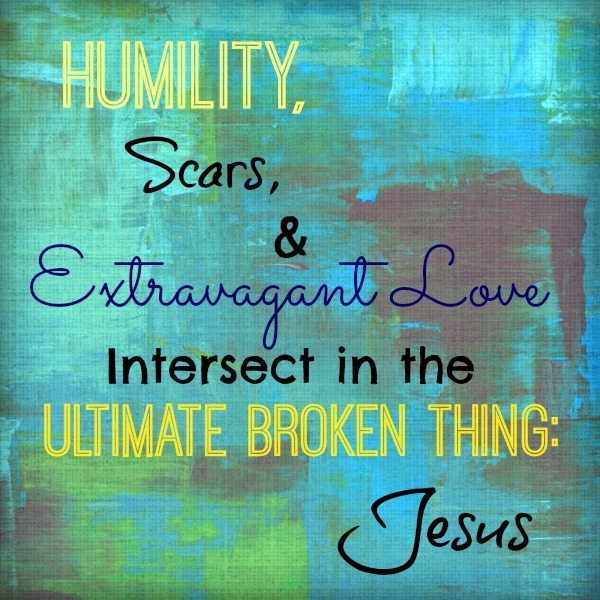 Finally, sometimes God combines these three: humility, scars, and extravagant love. They intersect in the ultimate “broken thing,” Jesus. He humbled himself even to death on the cross. Now alive, He bears the scars as a mark of His extravagant love. He heals broken things. He mends them with something much more valuable than gold. I marvel that He loves this clumsy, broken thing. Father thank you for spiritual brokenness. Thank you for bringing me often to a place of surrender and humility. Keep my heart ever tender before you. Use my brokenness to manifest your extravagant love. I have scars, but you heal them with something more precious than gold, that is, Yourself. This post appeared first at A Widow’s Might. Next > On how to love your grieving friend. I hope you’re having a good time with family! Thank you Amy Gayle. I do so love you and miss you too!